instead, we have trained our eyes to see (and even create) goodness around us. This is the act of becoming aware of things for which we could be grateful. Like saying to the self "Gee, this is a pretty nice day!" or "Wow, that peach tasted amazing" or "Hey... I'm alive!" Sometimes we're on auto-pilot and don't even stop to notice, i.e., we're not mindful. It's one thing to notice something nice and then move on to the next thought, the next idea, the next worry... But savoring is allowing that observation to linger, to expand in the mind. Literally, "savor" means to taste fully, with all the senses. So, not just noticing a nice day but giving ourselves time to reflect on all its dimensions -- like the soft breeze, the scattering of squirrels, the weight of shoes on the pavement, the sun's warmth on the arms... ahhh. A person can go around noticing and even relishing secretly in things. But real gratitude is something that, if experienced, cannot be contained. It must find its outlet, whether in a diary journal, or over a cup of tea with a friend, or shouted out from the top of a mountain climb. Expressing what we're grateful for, in turn, helps us to savor experiences more fully -- it makes our appreciation real, tangible. So start by noticing. Just looking around. Being an observer of the world around you. Then once you've noticed something, savor it. Try to come up with 5 things about it that you find incredible, or different, or human. Give yourself an extra 10 seconds to bask in appreciation for it. Finally, express it! Call a friend, or give someone a hug. Tell a coworker or the person next to you in line. Keep a running list in a notepad. Watch it grow. How often do you practice this "art"? Which component do you find yourself doing the most? The least? PS. THANK YOU for reading this blog! I am grateful for you. PS. Now available as an art print, tea mug, & market tote! I noticed your change and growth, I savored our new relationship, and I just want to tell you that you really amaze me and make my life meaningful! 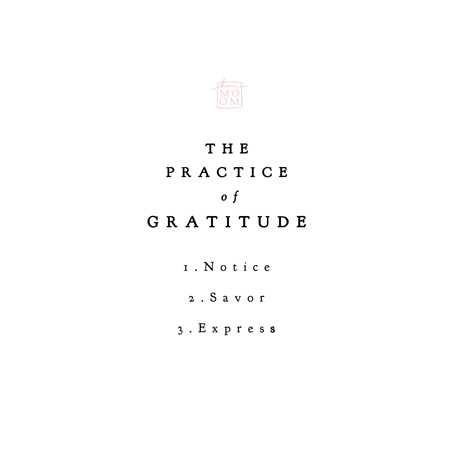 Hmm, never thought about gratitude in these 3 components before. Savor's probably the one I do least, which I guess means I should start trying it out more. (; I am grateful for you as well, Karmomo!